This was one of my (now) annual visits to Am Dram theatre, as the Tredegar Operatic Society put on their show for 2017, Sister Act. A show which has literally only finished touring a professional production in the last few weeks. Sister Act is obviously based on the 1992 movie of the same name which starred Whoopi Goldberg. It is also one of the increasing stage productions where the songs from the movie don’t appear (or at least feature) in the stage production. However I can say that once the show started the different songs didn’t affect my enjoyment at all. The show was funny, entertaining with some great songs. The cast were only amateur in the literal sense that they didn’t get paid to perform. There was nothing amateur about the effort, skill and talent on display. The story is of a club singer “Deloris Van Cartier” who witnesses her boyfriend, “Curtis Jackson” a gangster, kill a man So she has to go on the run to hide from him until she can give evidence at his trial for murder, (sounds a light, fun night out doesn’t it 😊). An old friend, now a policeman arranges for her to hide out in a local convent where she becomes “Sister Mary Clarence”. The sisters there have a choir in desperate need of divine intervention (sorry couldn’t resist 😊 ) so she gives them the benefit of her performance skills. 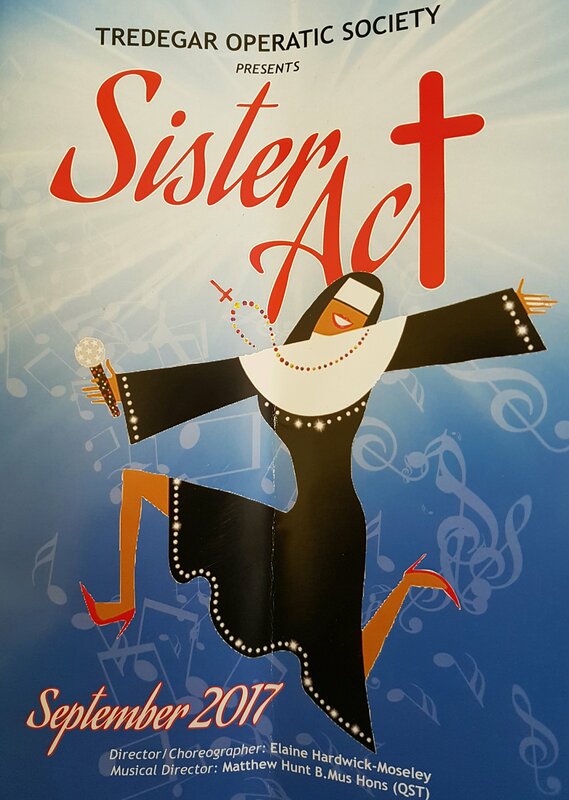 The Cast: led by Louise Luke “Deloris”, Donna James “Mother Superior”, Abi Hodges “Sister Mary Robert”, Sophie Davies “Sister Mary Patrick”, Michael Clutton “Curtis Jackson” and Matthew Oliver “Lt Eddie Souther” were excellent. Ably supported by the chorus and supporting players. There was a live band to provide the music under the leadership of Matthew Hunt (Conductor and Keyboards). The venue The Beaufort theatre, has modern but unfortunately NOT spacious seating, so my only two complaints were: the seating giving me DVT worries, not the company’s fault and something I’ve feared at some West End Venues, and the sound was a little forced at one or two points, it appeared to me they were putting too high a level through to few or too small speakers. However these small quibbles aside it did not spoil my enjoyment of a really fun show. Stand out songs for me: “Take me to Heaven”, “I could be that guy” and “The life I never led”. There wasn’t a bad performance in the whole cast, from the surprise “Drag Deloris” to the principals. However if I had to single out some of the cast it would have to be Louise Luke, Matthew Oliver, Sophie Davies and Abi Hodges. All of whom I believe have the skills and talent to make it in the professional theatre. A great nights entertainment and one which has made me realise I need to see more “AmDram” shows, so I plan to do this by seeing another company I know from years back doing their version of this show in October!